Here you will find LG G Pad 7.0 LTE firmware download. Below there are links to official and custom firmware for the tablet. But first we would like to recall the main features of the tablet. LG G Pad 7.0 LTE is an Android tablet that was released in 2014. At one time it was very popular due to its interesting specs and functions. 7-inch tablet display allows you to carry it in any bag, backpack or just in your hands. In addition, the tablet is light enough - 294 grams. As for performance, LG G Pad 7.0 LTE runs on Snapdragon 400 processor and 1 GB of RAM. This is enough to run most applications. The user also has 16 GB of internal memory for storing important files, documents, photos and other things. We should about another important part of any tablet - 4000 mAh battery. As you might have guessed from the name, LG G Pad 7.0 LTE supports LTE networks, so you can insert a micro-SIM card. Now let's look at LG G Pad 7.0 LTE firmware download. We offer you several firmware options so that you can choose the best one for you. 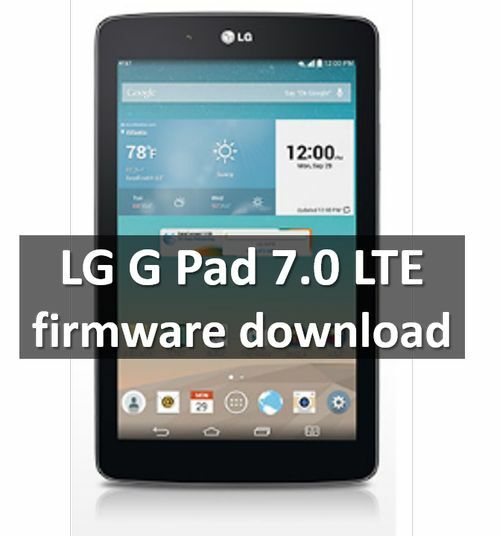 Here you can read how to install stock firmware on LG G Pad 7.0 LTE. That's all! If you have any questions about LG G Pad 7.0 LTE firmware download, please write in the comments below.